Which conservatory will best suit my home? A conservatory is an ideal addition to any home as it can be used all year round, adds value and space to your property and allows you to enjoy your garden regardless of the weather. With so much choice on the market, choosing which conservatory is best for your home can be difficult, so here we have shortlisted the most popular options. It is important to decide what function you want your conservatory to perform and thus deciding how often you will use it. For example, if you opt to transform your conservatory into a stylish kitchen extension or dining room, you are most likely going to use it daily. However, if you decide to create a second living room area, you may find you do not use it as often as you had originally planned. You want your conservatory to look like a part of your home, so choosing the right design and style is very important. There are a plethora of options to choose from which complements traditional and modern homes alike. Most conservatories are easily customised so you can get creative and practically design it yourself, so you can feel confident it will meet your criteria. Conservatories in Milton Keynes offer a generous selection of conservatory styles that will suit any property. The price of conservatories varies depending on many factors, including material, style and size. The amount you wish to spend is, of course, entirely your choice but knowing what your money can buy you will help you condense your list of options. More affordable conservatory options such as the Mediterranean style, generally start at around £7,500 while more luxurious styles such as a Lantern conservatory will cost you a minimum of around £13,000. If your conservatory covers over half of your garden, you will need planning permission which is something you need to take into consideration. Moreover, you do not want your conservatory to overpower your garden if you have a small outdoor space. To create a conservatory which is the perfect size for your home and garden, architects find the golden ratio to be the most effective solution. The most popular conservatory style in the UK is the Victorian. Its traditional exterior makes it suitable for many properties, and the multifaced design ensures you have panoramic views of your garden. This conservatory style is highly desirable due to its classic design which easily adds character to any home. Moreover, its distinguished pitched roof and faceted front give a curved appearance which has become an increasingly popular feature in modern homes. Georgian conservatories are a practical option due to its generic square shape and classic design which will compliment any property style. This style is incredibly space efficient, which is perfect if you want plenty of furniture in your conservatory or simply want to maximise floor space. Georgian conservatives seamlessly combine classic and contemporary which makes it suitable for traditional or modern homes. Georgian conservatories are available in a vast selection of colours making it easy for you to create a space that matches your home perfectly. Sometimes referred to as a lean-to conservatory, the Mediterranean style is extremely versatile and ideal for properties that have restricted space, e.g. bungalows. Conservatives with a complex design are not always practical or appropriate, but the Medetarroian conservatory boasts simplicity and style making it suitable for the majority of homes. Another benefit of this style is that it is cost-effective, making it ideal if you are on a budget. Thanks to its simplistic design, installation and maintenance costs are minimised, which make it one of the most affordable conservatory styles. If you like the simplistic design of a Mediterranean conservatory but the traditional aesthetic of a Victorian style, a P-shape conservatory is an ideal choice for you. Best suited for larger, detached properties, this conservatory is versatile and an effective way of adding extra space to your home. This conservatory is capable of being used as multiple functioning rooms due to its size so you can feel confident that your conservatory will frequently be used. Although P-shaped are the most popular, you can also choose from L,T or U shaped conservatories. You can opt for any of these shapes depending on the available space you have and the overall look you want to achieve. If you have a large property, a lantern conservatory will make a great addition to your home. Renowned for its unique two tired roof, this conservatory will effortlessly bring light and air into your home’s interior and offers an uninterrupted view of the sky. 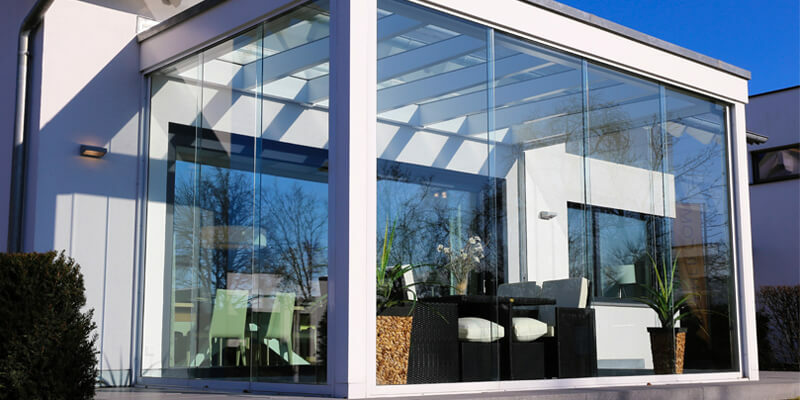 Although Lantern conservatories ensure your room is full of light, the extensive use of glass means it is also vulnerable to becoming unbearably hot. A simple solution is to invest in a ceiling fan which will keep your conservatory at a comfortable temperature all year round. Gable conservatories are best suited to high-ceilinged homes but are adaptable to satisfy the requirements of any property. Aesthetically, a gable conservatory is very eye-catching with its high roof and symmetrical design. Although this style of conservatory is widely used in stately British homes, it is an effective way to add personality to your home. To regulate the temperature in your gable conservatory, installing blinds can be very beneficial. With the choice of manual or remote control operation, you can sit in your conservatory for hours without feeling uncomfortable due to intense heat. Conservatories are a great addition to any home as they are incredibly versatile and can be customised to suit your preferences. Whether you want to use your conservatory as a dining room, second living room, kitchen extension or utility room, it is a fantastic investment which can be effortlessly adapted to suit your needs.